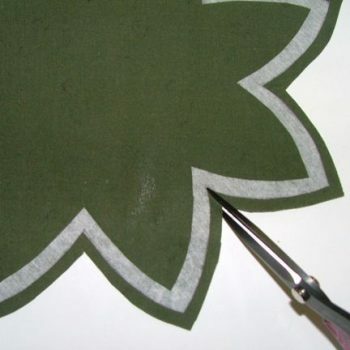 The Apliquick method for turned-edge appliqué is accomplished with the use of two 8-inch long customized metal rods. These tools provide unprecedented ease and precision for preparing fabric for hand or machine stitching – even miniature-sized. 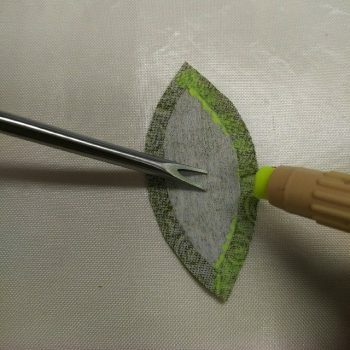 Here is a step-by-step guide to creating beautiful turned-edge appliqué using the Apliquick method. 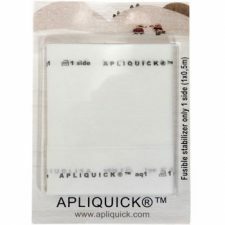 Apliquick interfacing is a light-weight material that is fusible on one side. It is 19.5″ wide and can be purchased in stores off the bolt or online in 1-meter precuts. Lay the interfacing over the pattern and trace each individual appliqué shape. If the shape repeats multiple times, trace the required number for each shape. 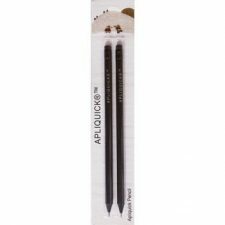 Apliquick pencils were specially designed for tracing shapes onto the interfacing. With a very soft lead, they glide over the fibers of the interfacing without catching and make a strong visible line. Bear in mind that shapes traced on the non-fusible side of the interfacing will reverse when applied to the appliqué fabric. If this is an issue, either reverse the pattern or trace the shape on the fusible side of the interfacing. 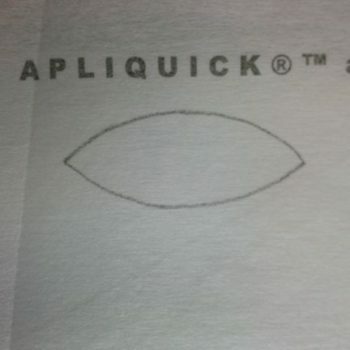 The Apliquick pencils work equally well on either side. The interfacing shape will be the template for the appliqué fabric and will remain inside the appliqué. Carefully and accurately cut out each shape. To get an accurate cut, I highly recommend using serrated-blade scissors. Apliquick scissors have a micro-serrated blade and come in two sizes: small (four-inch long with two-inch blades) and large (six-inch long with three-inch blades). Perfect Scissors, by Karen Kay Buckley, also have a serrated blade plus they feature large handles with a comfortable grip. I particularly like the medium size (six-inch long with two-inch blades) and the large size (seven-and-a-half-inch long with three-inch blades). 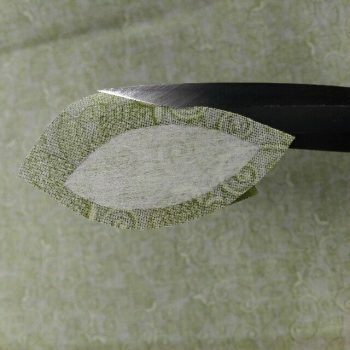 For large shapes, or layered shapes, you may want to also cut out the middle of the shape to conserve interfacing and reduce bulk. Leave a quarter to a half inch of interfacing around the outside edges of the shape. The shiny side of the interfacing is the fusible side. 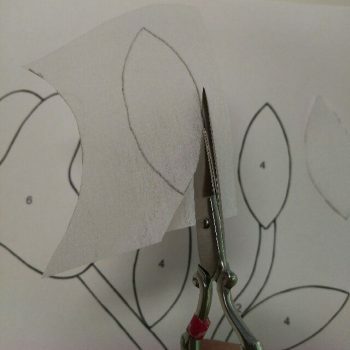 Place each shape, fusible side down, on the wrong side of the appliqué fabric. Be sure to leave enough room around each shape for the seam allowance. Set the iron to a low cotton setting without steam. 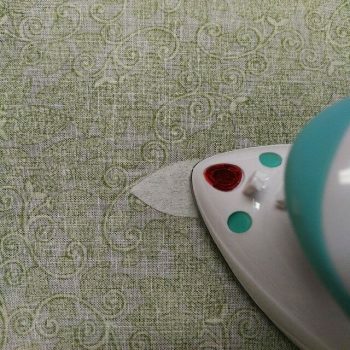 Too much heat will melt the interfacing, so start off low until you find the best setting on your iron. Press for 3-5 seconds until the edges are securely fastened to the fabric. Cut the appliqué fabric leaving an approximate quarter-inch seam allowance around the outside edge of the interfacing shape. The width of the seam allowance may vary depending on the size of the shape and your personal preference. Too much seam allowance will add bulk and may be difficult to turn smoothly, especially around tight curves. Too little seam allowance may fray or be challenging to maneuver. With practice and experimentation, you will find the ideal width that works best for you. Clip the seam allowance along inside curves and at inside points. 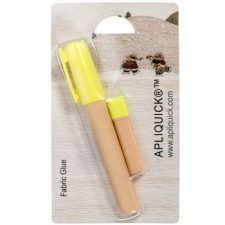 Apliquick glue starts out colored (yellow or blue) and then dries clear. With a pen-like shape and 3/8-inch tip, it is exceptionally accurate and easy to use. It is solvent-free, water-soluble and refillable, with one refill cartridge included and additional three-packs available. Apply a generous amount of glue to the wrong side of the fabric along the seam allowance. The glue has a quick drying time so I work on small sections at a time. I also like to work on a Teflon pressing sheet, which keeps my working surface clean and washes up easily with a wipe or wet paper towel. 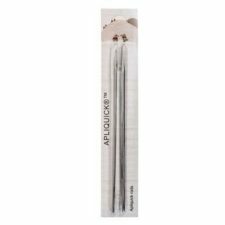 There are two Apliquick rods in a set, each with its own function: one has a forked end for gripping the fabric; the other has a flat tapered end for easily and accurately turning the seam allowance. 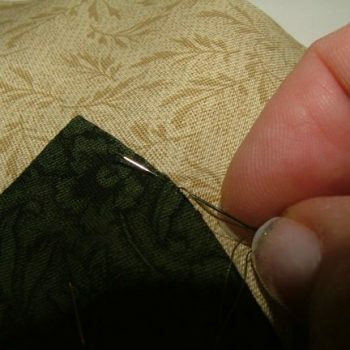 Hold the forked rod in your weaker hand and keep it firmly positioned on the appliqué shape during this step. Hold the tapered rod in your dominant hand (your right hand, if you are right-handed) with the flat edge parallel to the table. Use it to pick up the seam allowance and smooth it over the edge of the interfacing. The other ends of the rods are pointed, like knitting needles. 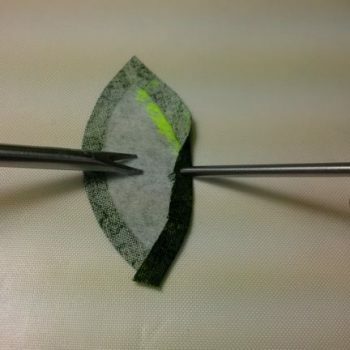 The pointed end of the forked rod can be used for gripping smaller appliqué shapes; the pointed end of the tapered rod is great for smoothing out any little puckers that form along the edge of the seam allowance. 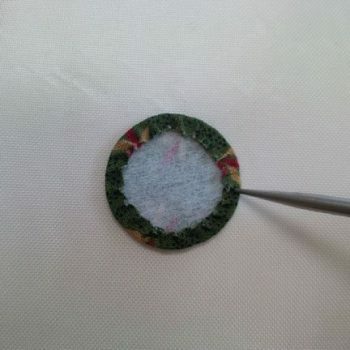 The prepared patches can be stitched to the background by hand or by machine. For hand stitching, thread an appliqué needle with fine cotton or silk thread that matches the appliqué fabric and knot the end. Bring the needle up through the appliqué patch, catching just a couple of threads in the folded edge, and tuck the thread tail under the patch. Avoid inside and outside points for this first stitch. Insert the needle into the background fabric straight across from the thread in the appliqué patch, take a small stitch, and bring the needle back up into the appliqué fold. Continue stitching until the patch is completely secured to the background. 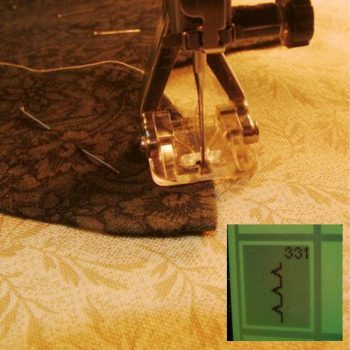 For machine sewing, set up your sewing machine with fine cotton or silk thread that matches the appliqué fabric or with invisible monofilament thread in the needle and a neutral-color cotton thread in the bobbin. I prefer to use the blind hem stitch for machine appliqué , but you could also choose a small zigzag, blanket, satin, or even a straight stitch. Adjust the stitch width and stitch length to make a small stitch; on my machine, the settings are 1.0 for the width and length. Position the blind hem stitch so the straight part of the stitch lands on the background fabric beside the appliqué and the zigzag part of the stitch just catches the fold of the appliqué . Stitch around the shape until it is completely secured to the background. 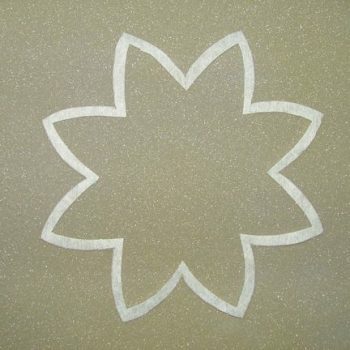 You will be amazed at how easy it is to achieve outstanding results with the Apliquick method for turned-edge appliqué! Thanks Faye. Perhaps you can find the tip you are looking for at https://kathykwylie.com/2015/08/turned-edge-applique-challenge-5/.